Color coded bathymetry show- nections. Mapping the global ocean can Forum will draw upon the combined ex- ing sunken vessel on sea? oor. only be achieved by working together, perience and acumen of business heads at a variety of scales and across different and senior strategists to examine com- sectors of the maritime community. We pelling technological concerns for the need an all-hands-on-deck approach and future of a sustainable Blue Economy. Dr. Brumley is emphatic about the sig- and vice versa. Color coded bathymetry of mapping objectives. 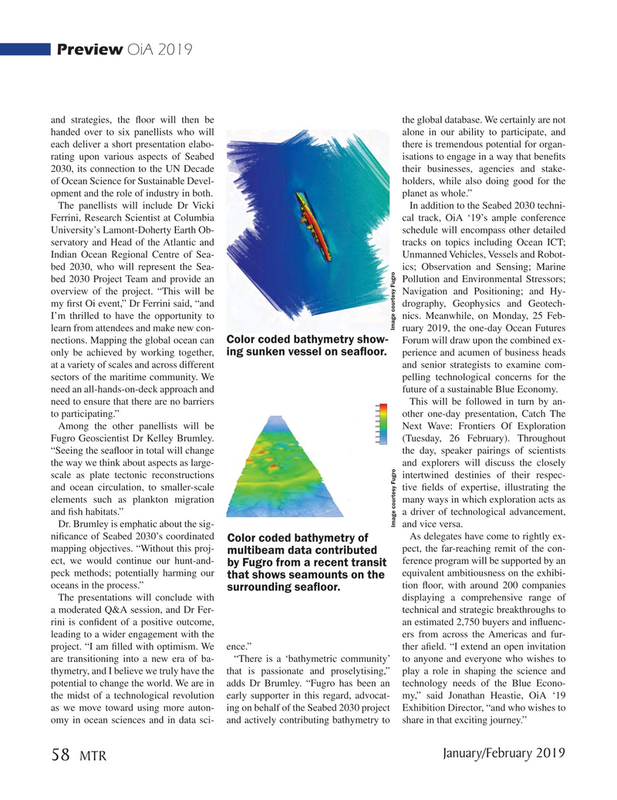 “Without this proj- pect, the far-reaching remit of the con- multibeam data contributed ect, we would continue our hunt-and- ference program will be supported by an by Fugro from a recent transit peck methods; potentially harming our equivalent ambitiousness on the exhibi- that shows seamounts on the oceans in the process.” tion ? oor, with around 200 companies surrounding sea? oor.